Be the first to share your favorite memory, photo or story of Bernette. This memorial page is dedicated for family, friends and future generations to celebrate the life of their loved one. 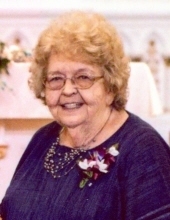 Bernette Ann Njus, age 79, of Lawler, Iowa died Friday March 29, 2019, at her home in Lawler with family at her side. Funeral services will be held 10:30 a.m. Wednesday, April 3, 2019, at Immanuel Lutheran Church - Crane Creek, rural Lawler, IA, with interment at Our Lady of Mt. Carmel Cemetery in Lawler with Dennis Njus, Deb Njus-Heckman, Dawn Njus, David Njus, Eric Njus, and Zach Njus serving as pallbearers. Honorary pallbearers will be Bernette’s grandchildren Coral Njus, Chris Thies, Allie Njus, Macie Njus and Nick Njus. Friends may greet the family 4:00 - 7:00 p.m. Tuesday, April 2, 2019, at the Hugeback Johnson Funeral Home in New Hampton. Visitation continues an hour prior to the service at the church on Wednesday. Bernette Ann Njus was born November 29, 1939, in Tripoli, IA, the youngest of three children. She attended Fremont #7 County School in Bremer county and graduated from the Tripoli High School in 1958. Bernette devoted her life to caring for people. She began working at St. Joseph’s Hospital in New Hampton in the early 1960’s as a nurse’s aide, which is where she met the love of her life, Lyle. The couple was married on April 28, 1962, at Grace Lutheran Church in Tripoli. To this union, four children were born: Dennis, Deb, Dawn, and David. After working at St. Joseph’s Hospital, Bernette went to work third shift at New Hampton Care Center. She really enjoyed helping take care of people. In 1979, Bernette helped establish the Chickasaw County Home Healthcare program, was named Director in 1981 where she worked for 27 years until her retirement in 2006. Bernette found her joy in life by gathering her family together for meals, holiday celebrations, and simply just being there to visit in her home. Bernette took pride in her flower beds, cooking and baking, Christmas light display, having trick or treaters at the house with a family chili feed to wrap up the evening, and packing picnic lunches to enjoy a family outing with fishing, shopping, or playing ball at a park. Crane Creek Church was dear to Bernette’s heart and she loved going to sunrise services and making dinner rolls for church dinners, as long as her health allowed her to. Bernette is survived by her husband, Lyle Njus of Lawler, IA; an adopted son, Eric Njus(Samantha Finger), Lawler, IA; two sons; Dennis (Connie) Njus of New Hampton, IA, David Njus(Lisa Myers) of Lawler, IA; two daughters, Deb (Nick) Njus-Heckman of Lawler, IA, Dawn Njus (Greg Thies) of New Hampton,IA; one brother, Charles (Connie) Hay of Denver, IA; seven grandchildren, Eric Njus (Samantha Finger), Zach (Nikki) Njus, Coral Njus, Chris Thies, Allie Njus, Macie Njus, Nick Njus. To send flowers or a remembrance gift to the family of Bernette Ann Njus, please visit our Tribute Store. "Email Address" would like to share the life celebration of Bernette Ann Njus. Click on the "link" to go to share a favorite memory or leave a condolence message for the family.